How to make this dish of orange ginger honey Salmon. Simple dish only take a few minute to make up the basting sauce for your Salmon. A little fresh ground pepper and some garlic if you wish. 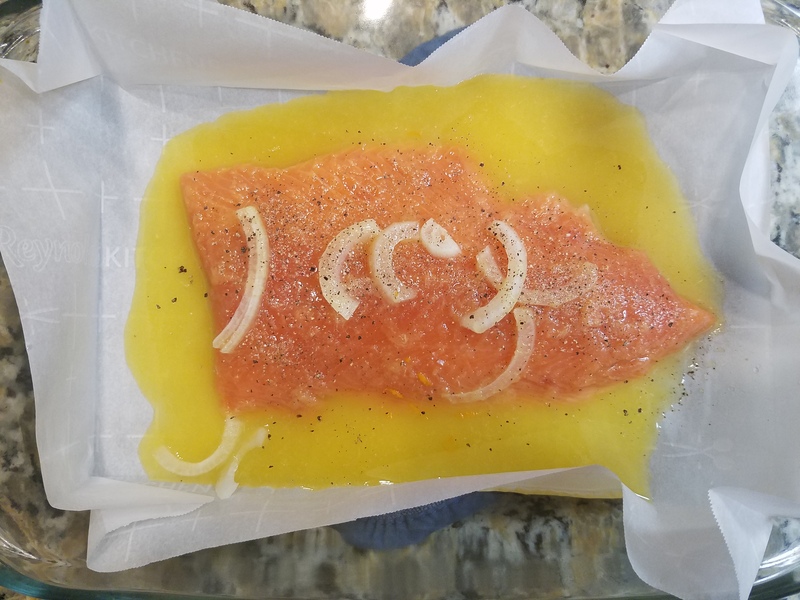 Take your Salmon and skin it, remove the fat line too. In the baking pan line it with parchment paper. Take the time to fold the corners it will make clean up a snap. Place the fish into the pan, pour the sauce on top and bake at 400 degrees for 10 minutes uncovered. This will help concentrate the flavors. After the first 10 minutes I added some peeled shrimp to the pan, after all everything is better with some shrimp. I used 31 to 40 size.